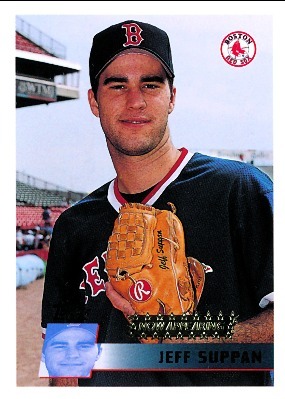 So Jeff Suppan was the Todd Van Poppel of the mid-90s? That was my initial reaction to the blurb on the back of the card. However, that’s not really true. As the card points out, Suppan had all the promise and pedigree of a highly touted young pitcher (he had more stuff than fluff which was the case with Van Poppel). And you can’t really fault those press clippings, as Suppan tore through the minors. 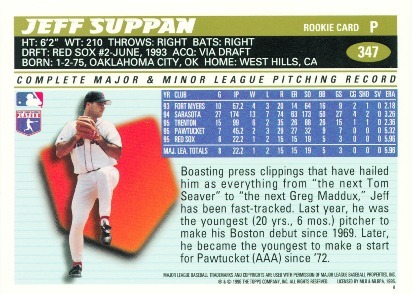 In 1996, at AAA and just 21-years-old, Suppan had a 5.68 K:BB rate. For whatever reason, though, his stuff at that time just couldn’t fool major league hitters. While he posted nearly a K per inning in the minors, he struggled to strike out more than five batters per nine with the Red Sox. After three unsuccessful seasons and 39 appearances (29 starts) with a 5.99 ERA, 1.60 WHIP and 1.83 K:BB rate, the Red Sox left him unprotected in the 1997 expansion draft* and the Diamondbacks pounced (that’s probably a poor onomatopoeia). He pitched horribly for Arizona and they soon sold him to Kansas City. While his tenure with the Royals was unspectacular, he pitched over 200 innings during each of his four full years there (from 1999-2002), combining for a 4.79 ERA, 1.42 WHIP and 1.60 K:BB rate. Dude just ate innings, pitching the seventh most during that span – just behind Livan Hernandez, Mike Mussina, Greg Maddux, Curt Schilling, Tom Glavine and Randy Johnson. After 2002, he signed as a free agent with the Pirates, who quickly traded him and Brandon Lyon to the Red Sox for Mike Gonzalez, Freddy Sanchez and dollar dollar bills. Talk about a deal involving some average players who ended up making serious bank. It was a one-year deal, so Suppan found himself a free agent again in 2003. That’s when he met the god that is Dave Duncan. From 2004-2006, he threw 572 innings for the Cardinals, posting a 3.95 ERA, 1.40 WHIP and 1.67 K:BB rate. Sure it was mostly smoke and mirrors, but that’s some quality durability. He also came through when it matted. He went 3-3 in the post-season for the Cardinals during that stretch and dominated the New York Mets in 2006. He threw 15 innings and allowed one earned run. He was the MVP of the NLCS that year and even took Steve Trachsel (a very similar pitcher) deep in game three. After his splendid 2006 regular and post season, Suppan was treated to a four-year $42 million contract by the Brewers (good gosh, my golly, what a folly). He pitched wretchedly for the Brewers, prompting one fan to put Suppan up for sale on eBay. He was eventually released, but scooped up by the Cardinals. He posted a 3.84 ERA, 1.49 WHIP and 1.32 K:BB rate for the Cardinals in 70.1 IPs during 2010. That would be his last season in the majors. While I was able to mention Suppan in the same breath as Maddux in this piece, he never lived up to those press clippings. However, the $58 million he earned in his playing time, the NLCS MVP, 2006 World Champion and 12.8 WAR suggest he was a far better player than Van Poppel ever was (TVP was worth -2.1 WAR during his career). *Man, there were four total All-stars in that draft (although possibly a Hall of Famer in Bobby Abreu). One All-star, Damian Miller, I vaguely remember as a subpar catcher. While I was annoyed Esteban Yan was gone from the Orioles, it didn’t hurt as much as Aaron Ledesma being scooped up in the final round. I was 15 when he played for the Orioles – I had no clue he was 26 at the time as I had never heard of him. That year was magical for the Orioles (at least for awhile) and I remember an 11-3 loss to the Tigers pretty well. Jimmy Key continued his second half swoon and Esteban Yan compounded the damage, but a scrappy infielder went 2-4, raising his average to .345. Ledesma hit .352 that year for the Orioles but didn’t make a postseason appearance. The following year he hit .324 for Tampa Bay, then would be out of baseball two years later. The only two HRs he ever hit were for the Orioles and he finished with a .296/.338/.365 line. His dWAR seems average, so I’m surprised his bat never stuck. Maybe he just wasn’t that good…like Luis Mercedes. 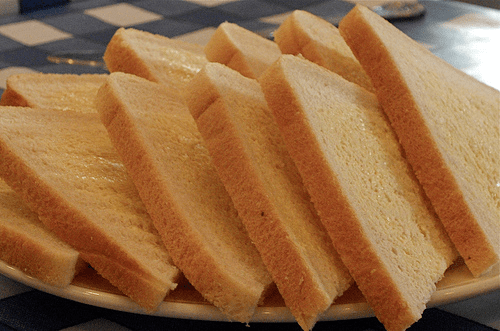 It doesn’t get any more white bread than Scott Fletcher, me thinks. There are so many generic “scrappy” middle infielders that Fletcher can get lost in history. However, I posit that Fletcher was perhaps the most “scrappy” middle infielder of all time, at least tangentially. What does he like to do? Fish and golf – doesn’t get any more mundane than that (although I do enjoy both activities in moderation and as long as I don’t have to touch the bait). The Imperials, his favorite musical group, are an American Christian outfit that started as a southern gospel quartet. The group did work with Elvis, recorded the theme song to the Daniel Boone TV show and were the first Christian group to use cordless mics, four individual microphones on stage (at the same time!) and a live band on stage. Fletcher’s favorite food is the exotic chicken, book is the bible and he would like to meet Jesus. Well then. Hello Middle America. Still, he had a pretty good stretch from 1983-1988. Aside from 1985, he was worth more than 2.6 WAR every year and averaged 3 WAR per season. He was rewarded with a pretty big contract in 1980s terms, becoming the first athlete in the Dallas/Fort Worth area to earn more than $1 million a year, according to Wikipedia. Then, the following year, on July 29, 1989, he was traded by the Rangers along with Wilson Alvarez (who no-hit the Orioles, when I was sitting in the bleachers) and Sammy Sosa to the White Sox for Harold Baines and Fred Manrique. He had a pretty fascinating career: was drafted four times and traded three times. Still, the thing I find most fascinating is that he sold greeting cards door to door. This is even a thing? I guess nowadays people don’t sell anything door to door and travelling salesmen don’t really exist, but still, greeting cards? Were there no stores with soda fountains? Did his failure as a greeting card salesman lead to the rise of CVS around the country (there are five within three blocks of my house)? So many questions, so much Americana. 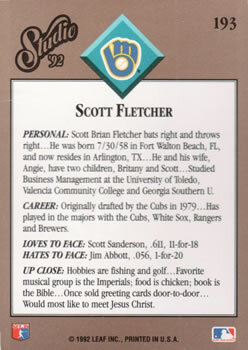 Scott Fletcher, IF, fisherman, golfer, chicken-lover, Bible-reader, greeting card salesman. I wonder if he ever earned a set of steak knives. I think, initially, this card stuck out for two reasons. One, I love Gary Roenicke (more on him later) and, two, tennis is one of the more exasperating sports (second only to golf in my opinion). What is it with rich people and bizarrely intricate athletics? When I was a kid, it was important to my parents that I be fluent in the art of the hardcourt. They had grown up without much money, put themselves through school and ascended to the upper middle class. So, on vacations, I’d always have to take tennis lessons. Mostly, during these lessons, I pretended I was Ken Griffey, Jr. or Barry Bonds and tried to hit every return over the fence. Exasperated, the tennis “pro” would send me off to the wilderness to retrieve the balls. Repeat this for one hour and you get the gist of my lessons. (Why I always emulated lefties is beyond me – maybe because I had a horrid backhand). Anyway, I’d also play my father in tennis at the end of every trip. While he isn’t all that athletic, he was better at tennis than me. I was faster/quicker and in better shape, but I could never get the ball to go where I wanted (maybe it had something to do with those lessons). My dad would play well enough to keep me around in the match. Invariably (because we’re both poor losers and intensely competitive), though, he would put me away and I would get frustrated. I knew it was happening and couldn’t stop it. Well, I knew one way to stop it. I would slam my racket on the ground like a petulant child. Consequently, tennis is not relaxing but anxiety producing – worse than swinging a driver and missing the ball completely. 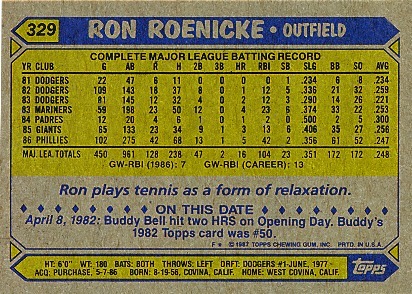 Roenicke had no problem with hand-eye coordination though, so tennis must have come easily to him. After all, he was a first round pick of the hometown Los Angeles Dodgers in 1977. He never really lived up to that billing though. He wouldn’t make it to the majors for four years (1981), when he was 24-years-old and he didn’t fare well in 22 games that year. However, he did show some promise the following season, going .259/.359/.336. Sure, you’d want more power from a corner outfielder, but this was 1982 and he did get on base. The Dodgers would release him in the middle of the following (unproductive) season, however. He bounced around for awhile, catching on here and there and not really getting to prove himself. 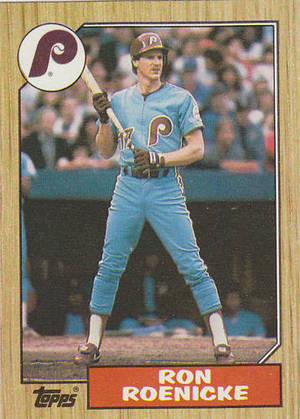 From 1984-1986, he played for three teams and posted a .252/.389/.379 line in 535 plate appearances. That had to have been the highlight of his career (and he even played in a post-season with the Padres). It’s a shame he never got to show what he could do on the field. He finished with a .238/.353/.338 line. 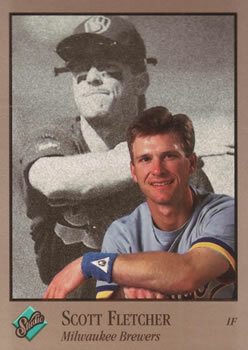 So, why did the name Roenicke stick out (I pulled this card from a pack before he became the Brewers manager)? Well, his brother, Gary Roenicke, was acquired by the Baltimore Orioles in 1977 (along with Joe Kerrigan and Don Stanhouse) for Rudy May, Randy Miller, and Bryn Smith. He was an Earl Weaver type of player. From 1979-1985, he appeared in 823 games for the Orioles, posting a .250/.356/.447 line. He hit lefties really well throughout his career (.255/.363/.454) and did a ton of damage for Earl Weaver as a platoon player. Gary finished with a .247/.351/.434 line, appeared in two World Series and won one. His final numbers are eerily similar to his brother. I like to think that what Gary learned from Earl Weaver maybe had a little to do with how Ron Roenicke manages. But really, I just like to see Weaver and they heyday of the Baltimore Orioles in any successful baseball squad. 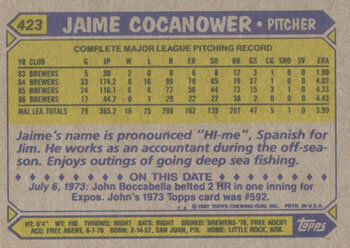 Let’s just say it’s a very good thing Cocanower was a numbers guy – as the numbers you see on the back of his card would be the last he ever compiled in major league baseball. Oddly enough, he finished with a 3.99 ERA in 365.2 innings – seems like a usable pitcher, no? Well, unfortunately, Cocanower was all wild thing (NSFW link)and no Vaughn. He finished second in wild pitches in the AL in 1984 and 1985 and second in hit batsman in ‘84 and sixth in ’85. He didn’t strike anyone out either – just 139 in his CAREER. He had a 0.69 K:BB rate. 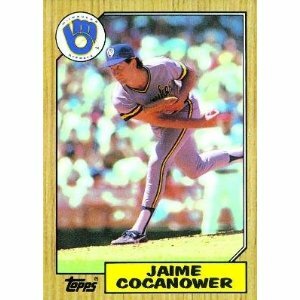 Aside from the lesson on how to pronounce Cocanower’s first name on the back of this card, what stood out was the poor phraseology of the last sentence. I’ve said it before, but it bears repeating. There is a scant amount of space on the back of a baseball card, you’d think the goal would be an economy of words. Yet, instead of enjoying deep sea fishing, he “enjoys outings of going deep sea fishing.” I’m no accountant but that seems like three words too much. It’s not often (although maybe it is) that you see, perhaps the second greatest English poet, have something in common with a journeyman major league pitcher. Clearly, Sparks deserved to be disgraced for dislocating his shoulder trying to tear a phone book in half. When your body is your moneymaker, let’s try to treat it nicely. I mean there is a reason contracts have strict clauses in them — you can thank the Steve Sparks of the world, also Clint Barmes, Jeff Kent, etc. While the dislocation breakdown is interesting, Sparks is one of the rare modern-day knuckleballers. As the card notes, its likely Sparks would have made the club in 1994 as a 28-year-old (knuckleballers are notoriously late bloomers). This is all by way of saying that in his first taste of major league action, Sparks, 29, lead his club in innings pitched. He threw 210 in 1995 and would have his best season for a long time in the majors. While his ERA (4.63) and WHIP (1.46) leave a lot to be desired, on account of his sheer amount of innings, he finished 9th in rookie of the year voting and was worth 3 WAR. It’d take three years before Sparks was that valuable again. In 1998, he posted a 4.34 ERA and 1.46 WHIP for the Angels in 128.2 IPs. Not great, but still about 2.8 WAR. He finally put it altogether in 2001 as a 35-year-old for the Detroit Tigers. He threw 232 innings, posted a 3.65 ERA and a 1.33 WHIP and was worth 4.2 WAR. He would be out of the majors just three years later. Still, for a guy who didn’t get to the majors until he was 29 (partly because he was an idiot), he amassed 1,319 innings and was worth, on average, roughly one win per year above a replacement. Not bad for Mr. Phone Book. The 1987 Oakland Athletics had the most eclectic team judging from the back of their baseball cards. If you don’t believe me, continue to read on. I have at least five or six more in addition to Mike Davis and Carney Lansford to write about. None, however, are more interesting than Moose Haas. Man, I’ve wanted to write about this one for so long. Basically, he is Jean-Claude Van Damme combined with Gob. Bluth and a dash of MacGyver. Of course, there is also the tiny fact that he goes by Moose (even though his real name is Bryan Edmund). He was also born in Baltimore, which is a city I love. Unfortunately for the nickname-, karate-, magic- and locksmith-loving public, 1987 would be the last year in the majors for Haas. He ended with a pretty impressive 12-year career going 100-83 with a 4.01 ERA and 1.30 WHIP. In reality, he could have used a bit more Bluth/MacGyver in him as he posted a miniscule 4.6 K/9 rate and a 1.96 K:BB rate. With a little more illusionary capabilities, Moose Haas could have been a household name.